I loved every part of Gary Chapman’s book titled, The 5 Love Languages. A quick summary of this book is that it was written to help us identify how we give and receive love in our relationships. There are 5 main expressions of love that the book describes: Words of Affirmation, Physical Touch, Quality Time, Acts of Service and Receiving Gifts. This isn’t my first time completing the quiz. A few years ago I was also curious to see where I ranked. The reason for the updated quiz now, is because I wanted to see how my love language changed after a few important life events: Marriage, a baby, relocating and job changes. I also wanted to take the test again to keep myself focused on growing my relationship as best as I can. With this information I can share it with my husband and he can do the same. You DO NOT have to take this test in order to discover these qualities about yourself. Many of you already know the answers and have been applying what you know for as long as you can remember. Many of you are also in tune with your significant other and can make these types of changes without breaking a sweat! For those of you who are more of a visual person (guilty), this allows you the opportunity to refer back to your results if need be. Each of us experiences life events such as career changes, health concerns, a change in finances, relationship status and/or family that impact how we relate to one another. But, what we need to do next is make necessary changes in order to meet our new levels of need. What you want, what you like, what you didn’t want or didn’t like has probably changed and that’s ok too. Even without experiencing huge life events, what we need from others may very well change as you grow. The most important thing that I’ve discovered after this quiz, was how our needs have changed. Yes, I knew life would be different. But, this was a reminder to me that my husband and I needed to be regroup in order to continue building our marital foundation. Something that changed for me was my score for Words of Affirmation (expressing myself and hearing words like “I love you”). Previously this was important to me, but not a deal breaker. I was always shy and believed that people just knew how I felt. I liked hearing nice things but I was also not too hurt if I didn’t. Oh how things have changed! I absolutely love hearing kind words. I love sharing how I feel with my husband and other loved ones. I’m learning the power of my words. The Bible describes how we each have the power to speak life into others as well as ourselves. I want to encourage and uplift my household and anyone who I may come into contact with. My relationships mean so much to me and I want to nurture them anyway that I can. Positive and clear communication is everything to me now. I’m still working on this though. But no ones perfect, right? If you’ve been going though some rough times in your relationships with your significant other, your kids, friends, etc. I would consider taking this quiz. It may help offer more insight into what you need from others and help you to pinpoint exactly what that may be, if you’re having trouble figuring it out. It may also help you better understand someone who you’ve placed in the “they’re just off” category. It’s possible that your view of those relationships may just change. Take Care of Your Needs and Grow in Your Relationships! Click HERE for the link to the brief quiz to discover your love language! I was recently nominated for such an incredible award by YOUnfolded! What an honor to receive the Encouraging Thunder Award! I am new to blogging, and this truly means so much. I love that Nena has been such an inspiration. We connected not to long ago, and she continues to show her support by reaching out when she can. Her blog is one I often frequent, due to the overflow of recommendations on how to improve your overall health, and ways to encourage others to be their best! For the past few years, I have had this tug in my heart. I felt lost. I did not feel 100% certain that I knew what I wanted to do for the rest of my life. This was frighteining for me, because I kept feeling as though this decision shouldn’t be that hard. I have been trying to figure out ways on how to fill that void. After some serious soul searching, and sleepless nights, I finally figured it out. I knew that I wanted to one day open up my own business where I could follow my passion of helping others improve themselves and their relationships, with the help of my degree in Marriage and Family Therapy. My goal is to create a family space, where I can help lead others on the path of their choice, and provide them with useful skills to help them overcome the obstacles to their happiness. I’ve always had some pretty big ideas about planning for my future, but I was always so quick to talk myself out of pursuing them. I was the Queen of negative messages, and I was surely lacking the confidence to begin achieving more for my life. Starting this blog was my way of changing that. I no longer wanted to think about the possibilities of starting a business. I needed to make this happen. My blog was the first step on my list of ways to push me out of my comfort zone. I had to begin believing in my talents. I needed a way to help me find my voice, and pursue the things that I love most! I want to continue documenting my growth in this transformation, as well as help provide inspiration, and knowledge on improving our relationships! 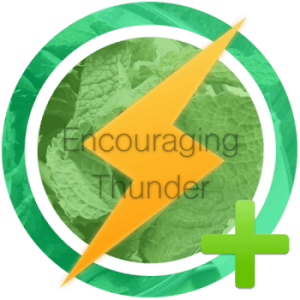 To show my appreciation, I am nominating these (5) bloggers for the Encouraging Thunder Award. I definitely follow some pretty awesome people. I’ve taken such a strong liking to the wonderful world of blogging, and have grown to look forwad to connecting with all of you daily! Family Love Does More: Angie Mc has been nothing but amazing! Her words have always been so kind! She has goals similar to my own, in that she provides wonderful tips and advice on how to improve yourself, as well as your relationships. EGOTist: One of my very first followers (not even sure if you knew that lol). Actor, singer, AND a writer! You will be able to connect to her posts, because her style of writing makes you fee as though you’ve know her for years! Estimating Infinity: Absolutely love her poems! They’re unique, and will leave you searching through the rest of her brilliant pieces. Lynz Real Cooking: Check out her page for delicious recipes from the Middle East! She also has some pretty cool stories to share from her experiences. I am thankful to have connected with so many wonderful people! I wish that I could send this award to everyone individually! Instead, I am sending positive vibes your way!